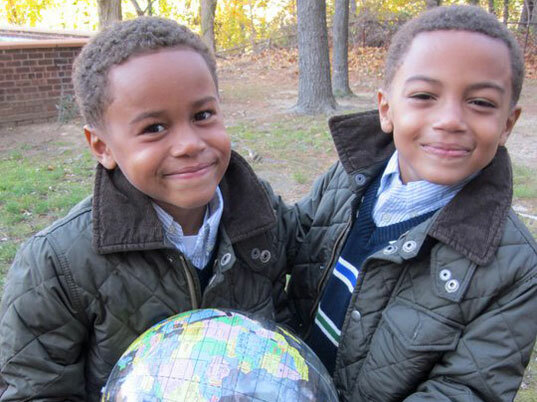 A lot of kids dream of having their own TV show, but Tristan and Tyler, 7 year old twin brothers, actually do — and they’re using their screen time for good, teaching kids how to go green. While you can’t catch the boys on TV, you can watch the series Tristan and Tyler’s Tales from the City! on the web. Each episode follows the twins to a new spot in New York City where they interview people about going green, make crafts with recycled supplies and offer ideas for family-friendly activities that promote a healthy planet. Check out one of their adventures and find out more after the jump. Most of the episodes, like the one above that features Tristan and Tyler at the Brooklyn Craft Farm upcyling a trash can into a robot, are under 5 minutes long — well within the attention span of both you and your kids. They currently have eight episodes up on their site and on Youtube ranging from interviewing a designer who turns umbrellas into dresses and accessories to having a t-shirt making party in the park. And more episodes are in the works. Tiffany, the twins’ mom and show producer, says they decided to start the web series last year because she noticed a lack of green and eco-friendly themes in kids entertainment. They aim to make the episodes educational and interactive — Tristan and Tyler quiz viewers on key parts of each episode, and whether crafting or recycling, you and your kids can do the activities that the pair demonstrates in each video. Check out the episodes with your kids and see if they get inspired to be more green! + Tristan and Tyler’s Tales from the City! I've also been following these boys for awhile and I'm amazed at how they're so into saving the planet. As an Educator myself, I incorporate activities and ideas in my classroom on how to make the earth greener by recycling materials and saving water. Kudos to Tristan & Tyler. I hope that your efforts to make the world greener inspires others to do the same. Yes, I also agree with Natalia C., I think these boys should have a TV show of their own! A lot of kids dream of having their own TV show, but Tristan and Tyler, 7 year old twin brothers, actually do -- and they're using their screen time for good, teaching kids how to go green. While you can't catch the boys on TV, you can watch the series Tristan and Tyler's Tales from the City! on the web. Each episode follows the twins to a new spot in New York City where they interview people about going green, make crafts with recycled supplies and offer ideas for family-friendly activities that promote a healthy planet. Check out one of their adventures and find out more after the jump.